Artavasdes II (Ancient Greek: ΒΑΣΙΛΕΟΣ ΑΡΤΑΥΑΖΔΟΥ Basileos Artavazdou, Armenian: Արտավազդ Երկրորդ Artavazd Yerkrord) was a King of the Kingdom of Armenia from 54 BC until 34 BC and a member of the Artaxiad Dynasty. 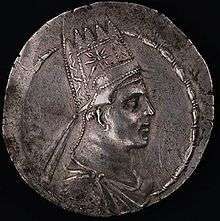 He succeeded his father, Tigranes the Great, also known as Tigranes II. Artavasdes II was an ally of Rome, but when Orodes II of Parthia invaded Armenia following his victory over the Roman general Marcus Licinius Crassus at the Battle of Carrhae in 53 BC, he was forced to join the Parthians. He gave his sister in marriage to Orodes' son and heir Pacorus. In 36 BC the Roman General Mark Antony invaded Armenia and Artavasdes II again switched sides, but abandoned the Romans once they had left Armenia to conquer Atropatene. In 34 BC Antony planned a new invasion of Armenia. First he sent his friend Quintus Dellius, who offered a betrothal of Antony's six-year-old son Alexander Helios to a daughter of Artavasdes II, but the Armenian king hesitated. Now the triumvir marched into the Roman western Armenia. He summoned Artavasdes II to Nicopolis, allegedly to prepare a new war against Parthia. Artavasdes II didn't come, so the Roman general quickly marched to the Armenian capital Artaxata. He arrested the king, hoping that with his hostages assistance to obtain great treasures in the Armenian castles. His son Artaxias II was elected as successor. After a lost battle Artaxias II fled to the Parthian king. Finally Antony took Artavasdes II to Alexandria. The Armenian king and his family, who were bound with golden chains, had to follow Antony in his triumphal procession. Cleopatra VII of Egypt awaited the triumvir on a golden throne, but Artavasdes II refused to render homage to the Egyptian Queen by Proskynesis. After the Battle of Actium 31 BC, the Armenian king was executed by beheading at the behest of Cleopatra. In the past he had been an enemy of his namesake, King Artavasdes I of Media Atropatene, who had become an ally of Antony. She sent his head to Artavasdes I of Media Atropatene to secure his help. Plutarch describes Artavasdes II as a well-educated man, who had a great fondness for all things Greek and was an accomplished scholar who composed Greek tragedies and histories. From an unnamed wife, he was survived by two sons: Artaxias II, Tigranes III and an unnamed daughter who possibly married King Archelaus of Cappadocia.